Earnings HQ: FBN’s Ashley Webster breaks down Lowe’s third-quarter earnings report. Lowe’s (NYSE:LOW) recorded a third-quarter profit that rose 17% and hiked its outlook as more homeowners take on do-it-yourself projects. The home improvement retailer earned $585 million, or 59 cents a share, compared to $499 million, or 47 cents a share, in the year-ago period. Net sales grew 5.6% to $13.68 billion. Analysts forecasted a smaller profit of 58 cents a share and revenue of $13.55 billion. Shares rallied $3, or 5.1%, to $61.53 in recent trading Wednesday. Lowe’s Chairman and Chief Executive Robert Niblock told analysts during a conference call lower fuel prices and interest rates are supporting consumer spending. He also noted an appreciation in home values. Niblock said homeowners, more than any time since 2006, are looking to invest in their homes, according to a Lowe’s consumer survey. Niblock added Lowe’s remains “cautiously optimistic about the home improvement landscape.” Larger rival Home Depot (NYSE:HD) also sees a continued recovery, Chief Executive Craig Menear said during an earnings call Tuesday. After lowering its guidance in August, Lowe’s now expects sales growth of 4.5% to 5% for the entire year. Previous guidance called for 4.5% growth. Lowe’s also widened its view for same-store sales, which are projected to come in between 3.5% and 4%. The Mooresville, N.C.-based company logged a 5.1% increase in same-store sales in the latest quarter. The result fell just shy of the 5.2% growth at Home Depot. 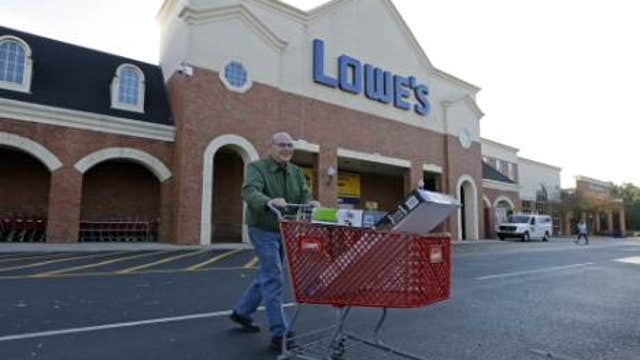 Lowe’s said its average customer ticket was up 3.4%, and transactions advanced 1.7%. Gross margin ticked slightly lower to 34.49% from 34.58%.